This September 28th will mark 20 years since the founding of Critical Mass in San Francisco in 1992. While Critical Mass remains a controversial subject in its place of birth, it has spread to hundreds of cities in dozens of countries, and become a truly global phenomenon. In September, bicyclists from around the world will be coming to San Francisco to celebrate the anniversary. 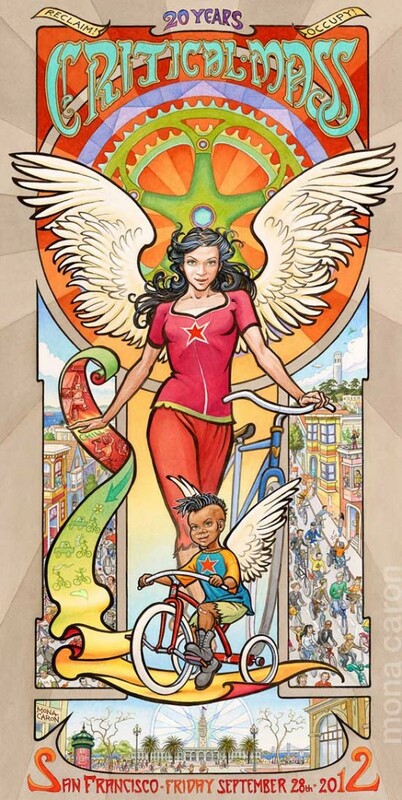 10 years ago I drew a poster for the 10th anniversary of the bicycle movement Critical Mass. Hard to believe it’s been a decade! This mere fact called for a remake. So here’s the sequel: an aged bike sprite with a new generation, plus a little reminder of good old CM etiquette tucked in, and an homage to a random assortment of rad bicycle people from SF and around the world. If you’ve wandered around San Francisco long enough, you’ve likely spied Mona’s stunning, detailed murals. We wrote about her work back in 2010. The poster is available to purchase from the sfcriticalmass.org site, and you can also download free jpgs of the image from the associated Flickr page.